Along with the flowers and the green grass of spring, all the little animal babies are beginning to arrive. The goats were the first to bring new life to the farm, then came the brooding hens. Now, these ladies are not to be messed with. They are very serious about sitting on their eggs, and they will put up with no nonsense. Especially from the humans around them. No sweet talking them for them and forget about touching them. The raptors from Jurassic Park are reincarnated in these hens. All the feathers on the head stand on end - that's the first warning to come no closer. The raptor noise starts, deep in the throat, if you pay no mind to that first warning. Now, if you have a fairly pleasant hen normally, she will not attack with a peck. She'll just keep up with the feathers and grumbling. But a more aggressive one has no problem delivering a few pecks to the hand. 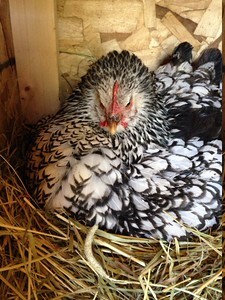 These mama hens pluck their belly feathers, deny themselves sun light and dirt baths, and stay in the coop to keep their clutches safe and warm. They eat very little so they don't have to leave their nests. This goes on for 21 days. When the chicks arrive, they are a whole different hen. And they are a joy to watch with their little followers scampering around the yard!